Amazon has the BASA Meal Prep Containers[20 Pack] 3 Compartment with Lids and 20 Free Forks – BPA Free Portion Control Bento Box – Food Prep Containers Stackable – Microwave / Dishwasher / Freezer Safe (28oz), Black priced at $15.99. Use code 4R7PCYLG at checkout and score this for only $10.87 with free shipping. MEAL PREP BENTO BOXES WITH 20 FREE FORKS. 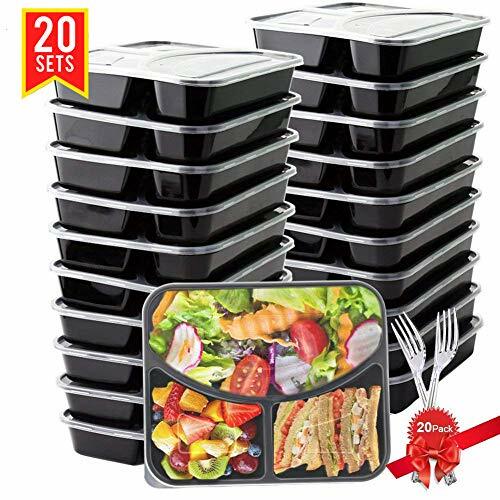 This 20-pack Meal Prep Containers with lids is great for store main course, salad and dessert separately in each container. Each lunch box can store a total of 28oz which can make you stay full and have a healthy serving! Package comes with free 20 forks for 20 food containers in case that you forget taking forks! MICROWAVE / DISHWASHER SAFE AND FOOD CONTAINERS. Made from BPA, PVC, and Phthalate free materials, these FDA approved meal prep containers 3 compartment are safe and recyclable to use. No strange taste and smell, best choice for adults and children. Able to withstand temperatures from -20C to +110C (-4F – 230F), they are both freezable and microwavable. The lid stays on and lock tight when it’s stored sideways in a backpack. SAVE SPACE, TIME AND MONEY. Compared to other food storage containers of different sizes which takes up a lot of room, BASA portion control bento boxes are easy to stack in the fridge and don’t take up too much space. The meal prep containers will make you eating healthy and economical, great for storing food, especially left overs, or pre-made lunches when you are go camping, attending sporting events or activities. PORTION CONTROL, STACKABLE AND EASY TO OPEN. Designed to serve the perfect portion, not too big or small, this food storage containers is very versatile to hold fresh salad, fruits or carrots. The lid with a corner flap contributes to easy open and air tight. Made of sturdy plastic material and it helps to achieve your nutritional goals. TRUSTED CUSTOMER SERVICE. If this food prep containers break or crack within 10 uses, just contact us at the first time and we will reply you within 24hrs and try our best to make up for your loss.